This chef-guided, small-group beverage and food tour takes a journey through Pacific Northwest culture by tasting Pike Place Market's fabulous selection of beer and wine paired with delicious bites at our local vendors. Get the inside scoop on where chefs shop and where locals hang out. You'll try a variety of local wines and beers while making new food loving friends along the way. 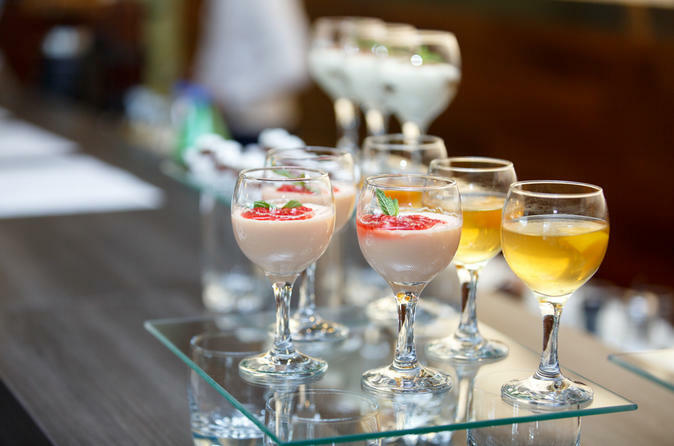 All groups are kept to smaller sizes to ensure easier navigation of the market, more tastings, and a better platform to ask questions and interact with the group. This 2-hour Happy Hour tour begins at Pike Brewing Company. Your chef guide will give an introduction to Pike Place Market and you'll learn about how the market got started and why it's so important to both chefs and local residents alike. You'll sample some beer and bites, and then you'll travel on foot to six stops around Pike Place Market featuring different wines, beers and cocktails paired with snacks representing northwest flavors. Let our chefs take your palate on an journey as we taste our way through our historical market and make new food loving friends along the way.